While the world at large may not be in the know where Netflix’s ratings success is concerned, it’s clearly obvious to everyone that the streaming giant has very little trouble calling for additional courses of everything it ordered in the first place. Speaking of orders and courses – totally unplanned segue, guys, really – Netflix is double dipping into the culinary world for more episodes of the docu-series Chef’s Table. Well, quadruple dipping, really, as the company confirmed three more seasons of Chef’s Table are coming to sate audiences hungry for more. 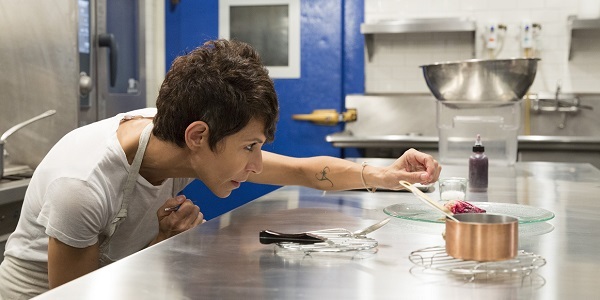 Not only did Netflix and show creator David Gelb come to an agreement on putting three additional seasons of Chef’s Table together, but they also managed to lock down most of the details about each upcoming season’s episodes. Let’s knock them out one by one, and in the interest of time, I won’t be labeling these chefs as “great” or “iconic” or anything, because it should be understood that just showing up in this series is proof of one’s monumental skills and numerous accolades. Season 2 already has a premiere date set for May 27, and it will be comprised of six episodes just as Season 1 was. To be expected, there is a different line-up of chefs getting the episode-long focus this time around. That group includes Brazil’s Alex Atala, Slovenia’s Ana Ros, San Francisco’s Dominique Crenn, Mexico’s Enrique Olvera, Thailand’s Gaggan Anand, and Chicago’s Grant Achatz. If you’re up on your culinary knowledge, then this definitely sounds like a fantastic batch of installments. Hopefully Achatz’s episode isn’t just him receiving awards. Season 3 of Chef’s Table will go in a slightly different direction both in terms of focus and episode count. This will be the “French Installment,” and it will consist of four episodes centered on French chefs Alain Passard, Michel Troigros, Adeline Grattard and Alexandre Couillon. This season doesn’t have an exact release date locked down, but it’s expected to also premiere this year, giving us a full 10 food-filled episodes in 2016. Back to basics for Chef’s Table Season 4, which returns to its six-episode global format. This time, we’ll get to spend an hour with maestros like U.S./Japan chef Ivan Orkin, South Korea’s Jeong Kwan, the U.S.’ Nancy Silverton, Germany’s Tim Raue, Peru’s Virgilio Martinez and Russia’s Vladimir Mukhin. This season also doesn’t have a release date set, but it’ll almost definitely debut in 2017. Netflix also recently went into barely-explored territory when it gave the prison drama Orange is the New Black a three-season renewal order, keeping Litchfield in our houses until at least 2019. The streaming service has also dished out single-season renewals for just about everything else, too, including the critically bludgeoned Fuller House, the psychological Marvel thriller Jessica Jones and many more. Add that to all the new series that are coming, and we might be existing solely through watching Netflix in 2020. Chef’s Table Season 2 will premiere all six episodes on Netflix on Friday, May 27. If you’re still looking for more food-related stuff to stream, check out Netflix’s Cooked.